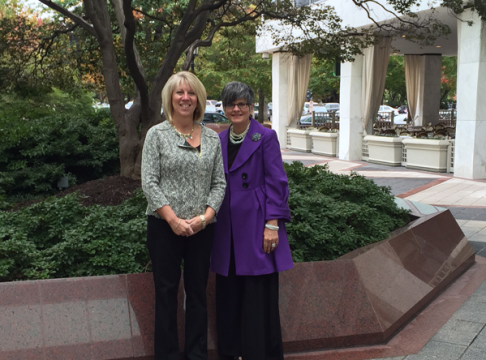 Lori Vedder and Mary Jo Sekelsky in Washington D.C.
A University of Michigan-Flint foster youth support program is gaining national recognition. Two university leaders were featured panelists at a recent Washington D.C. event held by the American Youth Policy Forum (AYPF), a national non-profit that focuses on issues affecting youth. Sekelsky and Vedder talked about Mpowering My Success, a UM-Flint program that gives support to students who were or are in foster care. The duo also attended an AYPF forum in Tennessee this summer, and participated in a webinar run by the organization this summer. 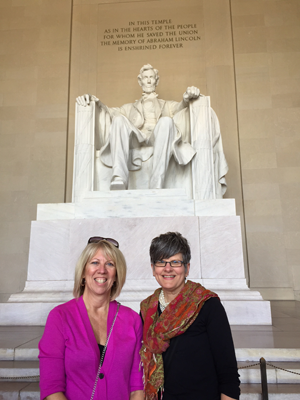 The AYPF paid for the pair’s trips to Tennessee and Washington D.C.
AYPF holds information and discussion-based events for policymakers, researchers, educators, and other leaders on issues related to the workforce, education, and youth. Too often, people in these groups work on the same problem at the same time but don’t collaborate, said Erin Russ, a program associate at AYPF. “We try to break down the silos between those groups,” Russ said. The organization has highlighted UM-Flint because of its collaborative approach with other groups in its overall support for students who have been in foster care at some point. “We were really impressed that UM-Flint reached out not just across campus but across the community,” she said. Mpowering My Success just entered its third year this semester. It has so far been funded through a $425,000 three-year grant from the Michigan Department of Human Services. Sekelsky and Vedder oversee the implementation of the grant. Sekelsky is co-authoring a book through Rowman & Littlefield Publishers about the challenges foster youth experience gaining access to college and graduating. For several years, the university has focused on integrating area agencies and community groups in the efforts, Sekelsky said. Students from foster youth programs often don’t have the sustained sources of support many people have throughout life. “We have surrounded the initiative with people who understand the importance of this work,” she said. That includes working with groups such as the Ennis Center for Children, the YWCA, the Michigan Department of Human Services, and other colleges. Cindy Nelson-Pouget, the initiative’s life skills coach, is a clinical social worker contracted out from the Ennis Center for Children. The program is for students ages 18, 19, and 20 who have been in foster care beginning on or after their fourteenth birthday. Students are set up with a faculty or staff mentor and get guidance on a bevy of issues, including finances, emotional support, relationships, and housing. 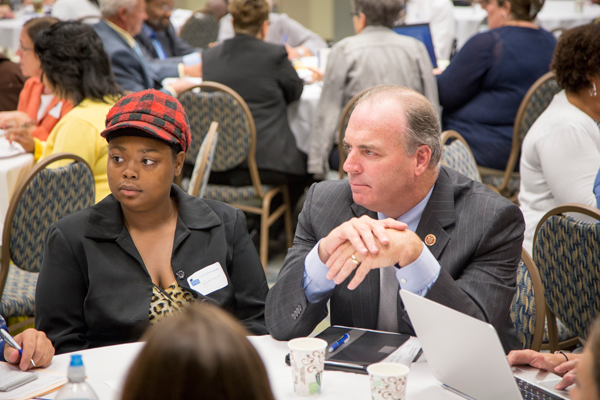 The university and the office of Congressman Dan Kildee co-sponsored a community roundtable in August about foster youth and higher education. Held on campus, it drew a litany of community leaders and several students with foster home backgrounds. The students spoke about their experiences navigating life in foster care. “We are not given a chance to know what normal is,” one noted. “Because of multiple moves it’s hard to stay in one place. I’m scared because foster care teaches you to go, not stay,” another said. Students are often provided emergency funds, such as for car repairs or a lack of food. Currently, there are eight students in the program, but university officials said they make sure to offer guidance and advice to students who don’t fit the specific guidelines of the program. The mentors and other staff stay in communication with those that have graduated, moved out of state, or are too old or young to be considered eligible for the program. Sekelsky said the Washington D.C. trip and other work with AYPF allowed UM-Flint to develop further contacts and exposure, including learning more about specific internships and programs for students. But it also gives others a chance to learn from the university. 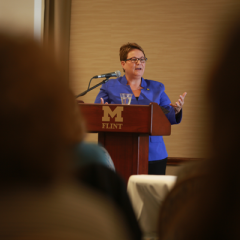 Eileen McCaffrey, executive director of Foster Care to Success, left the Washington D.C. event impressed with the University of Michigan-Flint. McCaffrey was on the same panel as Sekelsky and Vedder at the forum. Foster Care to Success is a national provider of college funding and support services for foster youth. “I think they are having a greater impact by facilitating conversation in the community about what young people need in terms of support,” she said. 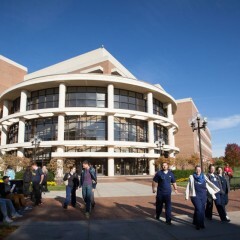 Contact University Relations staff writer Robert Gold with comments, questions, and ideas at goldr@umflint.edu, (810) 424-5596, or on Twitter, @writerobert.